If emerald mountains, turquoise waters, paradise islands and luxury hotels sounds like your thing, choose Taha’a for your honeymoon. 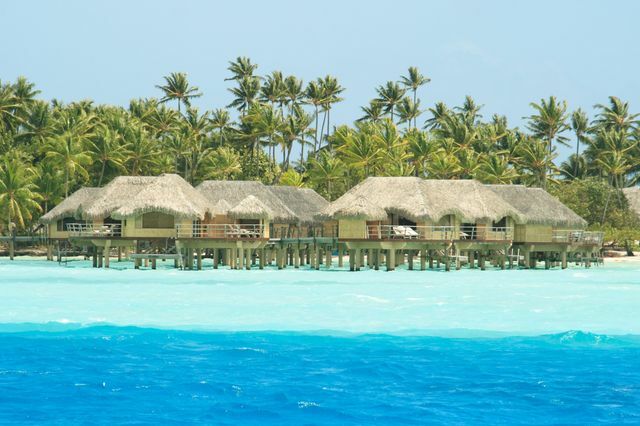 With the sweet smell of vanilla lingering in the air and a traditional way of life, this tranquil island in Tahiti is the perfect destination for a honeymoon. Wake in the morning to have your breakfast served on a private beach accompanied by traditional Tahitian music then spend your days snorkelling the brightly coloured reefs of the azure lagoon, spotting clownfish and stingrays. Or head out to one of the tiny, deserted motu islands for the day with no shoes, no news and no one else around but the two of you. Take in some culture on a 4 x 4 island tour into the interior where your expert guide will take you to meet artisans, botanical experts and pearl farmers and you’ll have the chance to explore this paradise island and sample it’s tropical fruit. In the evening, take a traditional Tahitian dance lesson to the sounds of the ukulele before returning to your beach cottage or overwater bungalow and listening to the sound of the waves lapping at the shore and observe some of the brightest skies in the world. A Taha'a honeymoon is one you are sure never to forget! There are two seasons in Taha’a. The low season is from November to April when you can expect high humidity and the chance of showers but there are still warm days and good deals to be had at the hotels. Cyclones are rare in this area with the last one occurring in 1982. The high season is from May to October when diving conditions are excellent and there is less humidity but be prepared to pay more and see more visitors to the island. The traditional Polynesian festival of Heiva occurs in July and is a great time to visit with colourful dinners, sports competitions and traditional dance and music performances. Have a Motu Picnic: What could be more romantic than sailing out to your own private paradise island for a picnic with your loved one?